That which is planned is tradition. That which is unplanned is imagination. That which is both is spirit. The yoga teacher education is a creative process, a dynamic training, a period of learning and, above all, a way of living. This is a process which is outwardly directed towards society, profound in the meditations and the methods we use, as well as in the way we live in our schools and ashrams. Our yoga teacher training is not just about meeting occasionally during the week and on certain weekends. It is a full-time education. It attracts people who are serious about yoga, who sincerely seek a meaningful way of living and working – and who will help others too. Around the education, we have created living conditions which make it possible to realise priorities normally unattainable in society – to incorporate and increase the joy of being, and struggling less towards becoming. The aim of the education and the training is personal growth and spiritual insight, based on a solid knowledge of yoga and meditation. It is a training which stands in contrast to the media society, where people’s minds are filled with information, but where personal experience is lacking. This has a disastrous effect and results in fear, numbness and passivity. Unfortunately, many forms of education suffer from this shortcoming. Even some yoga teacher training courses are only about cramming theoretical and mythological knowledge, with very little personal or individual practice, which limits the experience of the effects of yoga and meditation. It takes four years to become an independent yoga teacher at our school and two more years if one also wishes to teach meditation. 3) yogacharya (a spiritual preceptor and master of yoga). The diploma contains both general and personal information as well as listing what the teacher is qualified to teach. The yoga teacher training begins with the 3-Month Sadhana Retreat at Haa International Retreat Center. The language we teach in is English. There are no entrance requirements for this retreat, other than the desire to participate and learn what the course offers. This retreat alone is more comprehensive and profound than many of the yoga teacher training courses conducted around the world. Nevertheless, the objective of the 3-month retreat is not to educate teachers, nor does it give one the qualification to teach. It is foremost a process for your own development and insight. Regardless of what you will be doing after the 3-month course, it is a learning period which provides a unique basis for your sadhana (your personal practice of yoga and meditation) for years to come. Most people who participate in this retreat do not set out to join the yoga teacher education. On the yoga teachers seminars at Haa, in addition to the classes in the yoga room, teachers are involved in working on practical tasks together. Here, a drain ring is being manoeuvred into place with the children looking on in the background. At the end of the 3-month sadhana retreat, a talk takes place between the teacher and the student who wishes to join the education. If both parties are satisfied with this interview, then the student commits to being part of the education and the teacher commits to accepting and teaching the student according to the conditions outlined in this paper. The education will then take place in one of the city schools and/or at Haa Retreat Center. Can the pose be improved a little more? Correcting the Shoulderstand during a 14-day retreat at Haa. The year is divided into three teaching seasons, all of which consist of roughly four months each. In the summer, the schools in the cities are open most of the time, but the teachers and aspirants also spend time at Haa Retreat Center. At Haa, they either take part in a retreat or help in running the retreats and attend relevant teacher training classes. The rest of the year (September – December and January – April), the yoga teacher classes provide theoretical as well as practical insights into yoga. The various topics of the training are grouped together to form modules. One major module and other minor ones are dealt with between September and April. All modules are covered in 4 years. It is not enough to be a good yoga teacher. One also has to acquire practical skills, eg. 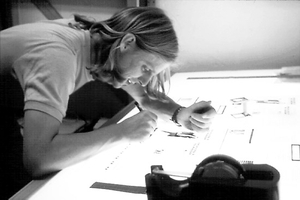 working with layout and computers. Hatha Yoga cleansing processes, including tratak (which is also a concentration technique). Asanas, the physical yoga poses and their effect on body, mind and psyche. Yoga therapy, which involves both the traditional knowledge of the yogis as well as current medical research on yoga; how yoga can be used as a healing method. The cleansing of energy flows, the awakening and use of psychic energy, involving Pranayama (breathing exercises); Mudras and Bandhas (attitudes and locks); Prana Vidya (‘knowledge of energy’ – a healing method) . The physical and psychosomatic benefits of Pranayama. The balancing of the communication of the two brain halves and more. Yogic relaxation in theory and practice, mainly based on the different structures and variations of Yoga Nidra (yogic deep relaxation), and on Shavasana (lying dead still) as well as on the methods of overcoming influences (Pratyahara). The latter happens through awareness, acceptance and confrontation, as well as through relaxation and meditation techniques. Most teachings on meditation take place in the yoga teacher seminars and the retreats at Haa Retreat Center, in Satsang with Swami Janakananda, in Antar Mauna (‘Inner Silence’) courses in Copenhagen and Stockholm, as well as in individual guidance and practice. The list below includes names of many of the subjects, methods, disciplines or groups of such, that the aspirant will become acquainted with during the education, both in practice and in theory. The pedagogy and practice of yoga. Here the teacher-aspirant teaches the other yoga teachers and receives constructive feedback. He or she is taught the structure of the different yoga programs and learns how to teach different levels of students, the content of each class, as well as learning how to progress from week to week and from season to season. The past week… Through questions and reports from the teaching of the ordinary classes in the school, the aspirant continuously receives the necessary guidance as the education progresses (see also below, the first year). a. Source material in the form of texts. c. Practical classes in the methods pertaining to the subjects of the current module. d. Individual practice and experience of the methods listed in relation to the module. Every week, one also attends group meditations and participates as a student or an assistant teacher in the yoga and/or meditation classes for the general public taught by the more experienced teachers of the school. An indispensable part of the education and training is Karma Yoga. It involves working together and communicating with the other yoga teachers in running the yoga school. This includes all tasks, such as writing, learning to use and work with computers, making lay-outs and distributing brochures, running the yoga shop, communicating with students, administration, planning courses, food preparation, cleaning, bookkeeping, caring for and training our horses, farming and gardening, forestry work, construction, counselling and, of course, teaching. “Karma Yoga trains your awareness and boosts your energy. It is easy to intellectually know what to do and how to handle a situation or a task, but what happens in practice? Are you able to break with old habits and limiting influences? You will know this through committing yourself to Karma Yoga. “In the yoga teacher education, we work practically with abilities essential for good leadership: Overview by handling various kinds of tasks, intuition through personal practice, training in communication and a conscious relationship to responsibility. The training is not laid down in advance, but evolves as a personal course according to capacities and skills – in the same way as the dynamics of a sound organisation. The school continuously collaborates with doctors and researchers in scientific research on yoga and meditation. Here, a teacher is being measured at the University Clinic in Cologne. 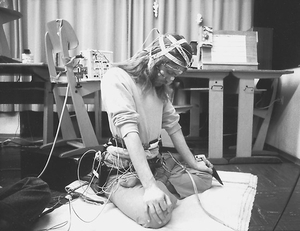 EEG, breath, blood pressure, and other data, are gathered in a computer for analysis and evaluation. 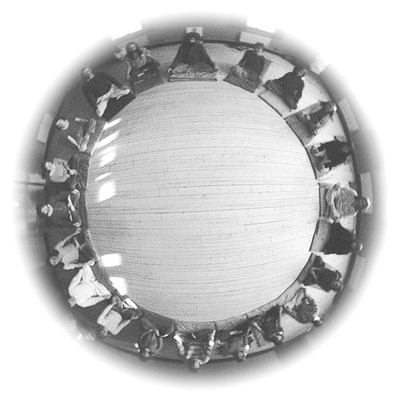 A fundamental part of the education is the annual program of yoga teacher seminars at Haa Retreat Center: two weeks in May, two weeks in August/September, a weekend in October and two and a half weeks in December. These seminars are guided by Swami Janakananda together with experienced yoga teachers from the different branches of the school. Since we have students in the group not only from the Scandinavian countries but from other countries as well, the common language is English. Apart from the general practices of yoga, meditation and satsang, each seminar has a main topic or theme, around which classes and discussions take place. The seminars are quite intensive and serve to strengthen the meditation and insights of the individual teachers – the seminars also function as a ‘cleansing process’ at the end of each season. They allow the teachers to, more thoroughly, let go of the influences and tensions collected during the busy work of teaching in the various schools – to again and again recharge, centre oneself and reaffirm the perspectives of the work we are doing. Therefore only a few hours each day are dedicated to strictly ‘theoretical’ classes. During these seminars, there is a focus on the individual’s practice of yoga and meditation. Each day starts with Kriya Yoga practice in the meditation hall (which is also the case for daily life in the schools), and followed up by one or two yoga classes during the day. In the evening, apart from talks and discussions, there are group meditations and sometimes kirtan (music and dance). The teachers and teacher-aspirants from all the ashrams meet and exchange experiences. Furthermore, the education is co-ordinated here for each season between the school’s different branches. We also work together with various practical tasks, eg. keeping the Haa Retreat Center well maintained. People come and go. And some of the independent teachers who have finished their formal education keep returning to the yoga teacher seminars in Haa. From time to time, medical doctors and other researchers from the fields of psychology have been invited as guest teachers on the yoga teacher education, mostly at our yoga teacher seminars. Courses have been conducted with Roop Verma in the type of Nada Yoga taught to and practised by Indian musicians. Other courses held include: The Tantric Yantra given by the Indian tantric painter Sohan Qadri; Sufi dancing; African drumming and dancing. We have also had an intensive course in time management, conflict resolution, and communication with Robyn Taylor, a highly qualified trainer from Australia. We have had a speech pedagogue and a neuro-psychologist with whom we have also conducted research. Ajit Mookerjee, who has written many books on Tantric art, and Jabrane Sebnat, a Moroccan Sufi master, are just two of the guest teachers who have met with the yoga teacher group at Haa over the years. The first year is preceded by participation in The 3-Month Sadhana Retreat in Haa, from January to April. After the course, the aspirants can remain living in Haa, providing back-up for the summer retreats and participate in a few yoga teacher classes during the summer. In September, the season with more intensive teaching starts; three yoga teacher classes each week, with teaching-training and theory; the aspirants also take part in yoga classes of the older teachers as assistants, and in the daily work and tasks in the ashram and at the retreat center. Sadhana: One’s own independent yoga and meditation practice is part of the daily routine of every year, for the duration of the education. Teaching practice: The aspirants start to teach one or two beginner classes during the second season of this year under the guidance of an experienced teacher. The second year. The individual sadhana of the aspirants is continued, deepened and stabilised further. The yoga teacher classes are continued. The aspirants begin to teach more classes and assume responsibilities in the various Karma Yoga tasks. The third year. Now, the aspirants have gained experience and assume more responsibility in the running of the school, in administration and planning, with the education and in teaching and guiding others. The fourth year. The aspirants now start to prepare for teaching meditation. After the fourth year, they have more and more opportunities to teach meditation. Naturally, the education varies according to individual needs and wishes, motivation and abilities. A yoga teacher education alone, however, is no guarantee. It is up to the individual – or as said by Swami Satyananda: “yoga does not liberate you, that you do yourself”. 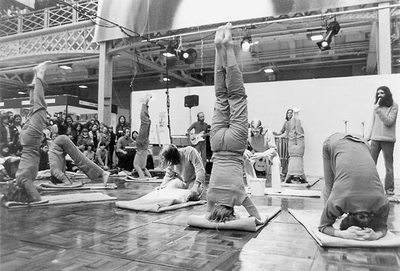 Yoga show with Swami Janakananda and yoga teachers in the Olympia Hall, London, 1979. The picture below on the left is from the same show, while the picture on the right is from a teaching situation at the same event. 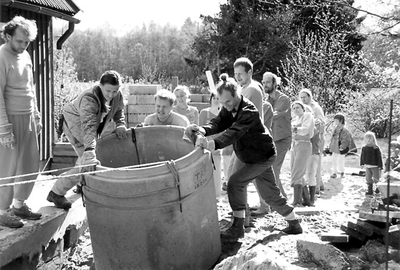 From time to time, starting with the International Convention in Monghyr in 1973, groups of teachers travel and participate in international yoga conventions, some under the auspices of The International Yoga Fellowship Movement. In 1977, the School itself arranged such a convention: Yoga, Meditation ´77 under the patronage of Swami Satyananda. Some of our teachers participated in a convention held in Bogota in 1995 and Sydney, Australia in 1996, to name a few. The yoga teachers and aspirants have also participated in several festivals such as Body, Mind and Spirit in London, New York, Copenhagen, Oslo, Stockholm and other cities. A few of us yoga teachers have received a swami initiation over the years. Some of the participants have received new names. This is based on a personal resolution and is not required in order to be part of the ashram or education. However, the life we lead is almost as intense and consistent as that of a sannyasin – a joyful balance between the inner life supported by meditation, and the life in society as active and creative teachers. What really matters is a meaningful and beneficial lifestyle and the way we explore our potential (sadhana). Many of us have had valuable training and communication with Swami Janakananda for more than the traditional twelve years. We are now seen as acharyas and preceptors rather than students, running the various schools in co-operation with each other. Others have, after many years in the school, created independent schools or are teaching on their own. There are also people living and participating in the ashram who do not want to become yoga teachers but who wish to devote a period of their lives to sadhana, where they can work with yoga and meditation in the best possible environment. Many of the teachers’ initial motive for joining the school were the same, to live in a place where sadhana was part of daily life. Little by little, however, they began to see the usefulness and value in teaching yoga to others. Details of the cost of the education are presented in the introduction to the yoga teacher training. The fees have been kept low as one lives an integrated life in the ashram. With higher costs, one would probably have employment obligations elsewhere, without time to spare and it would be impossible to receive a comprehensive training and education. Personal growth cannot be measured in terms of money or time. Time and motivation, however, make it possible to obtain substantial and consistent guidance according to a tradition that is alive and timeless. 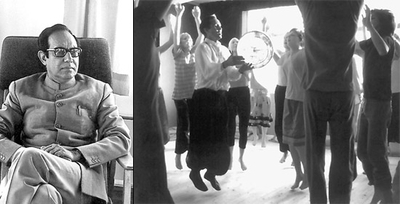 Paramhamsa Satyananda at the congress “Meditation, Yoga ’77” in Stockholm. that the teachers have developed a solid foundation to carry out their work without being overcome by the fear, doubt and faint heartedness which one often encounters in society and which we see limiting the way many yoga teachers teach around the world. 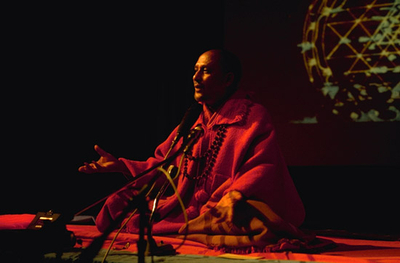 that through the education, the training and their sadhana, the teachers have received both tools and a perspective on life, which make it possible for the spiritual and the mundane, the inner and the outer, to merge in a natural and harmonious unity – a good basis for a life full of inspiration and meaning.